At 8:26 in the morning on Dec. 12, 2016, U.S. president-elect Donald Trump launched a Twitter attack at a seemingly unlikely target — Lockheed Martin. Specifically, the F-35 stealth fighter that the American aerospace giant is building for the U.S. military and America’s allies. Trump’s attack coincided with a four-percent drop in the Maryland-based company’s stock, wiping out $4 billion in wealth. By the close of business on Dec. 12, Lockheed stock had recovered half of the day’s loss. The timing of Trump’s rant and the hit to Lockheed’s stock is … weird, to say the least. It appears someone began dumping shares before Trump pressed “tweet.” As though the sell-off and Trump’s attack were coordinated. The president-elect’s Twitter rants are notorious and often target American businesses against which Trump reportedly holds personal grudges. Earlier in December 2016, the real-estate mogul and reality-T.V. star had attacked Boeing and the new Air Force One that the Chicago company is developing for the U.S. Air Force. Trump’s rant against Boeing came an hour after The Chicago Tribune published a column quoting Boeing CEO Dennis Muilenbur mildly criticizing the president-elect’s anti-China rhetoric. If Trump’s assault on Boeing was ego-driven, did his attack on Lockheed also somehow get personal? It’s hard to say. But consider what software engineer Christopher Bouzy discovered after checking the timestamp of Trump’s rant against Lockheed against the ticker showing Lockheed’s stock price. “Someone started dumping Lockheed Martin stock just before Trump’s tweet,” Bouzy pointed out on Twitter. Six minutes before, to be exact. Bouzy asked his Twitter followers to verify that Twitter accurately displays the time that a user publishes a tweet. The consensus seems to be … yes, the timestamp is accurate. 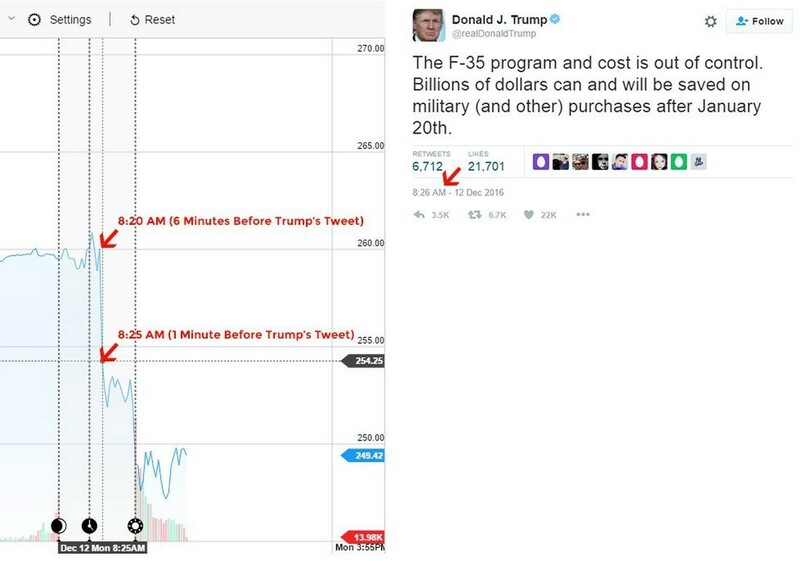 Likewise, there was some debate among Bouzy’s followers over just how much of the sell-off occurred before the president-elect launched his attack — and how much that volume matters to Bouzy’s implication that some investor apparently knew that Trump was about to criticize Lockheed, and sold shares right before the tweet in order to insulate themself from financial harm. Who that someone might be remains a mystery. Trump has not released his tax returns, voluntarily detailed his personal debt or proved his claim that he sold his own stocks in order to avoid possible conflicts of interest as president. We don’t know how much Trump is worth, exactly where his money comes from or precisely how he plans to continue making money after he takes office in January 2017. Who has inside knowledge of Trump’s plans? To whom does Trump owe financial favors? We don’t know. To understand politics, follow the money. At first glance, it appears someone knew about Trump’s planned Twitter attack on Lockheed — and dumped stock in order to insulate themself from the inevitable damage the president-elect’s tweet would cause. Over at Politico, Ben White and Patrick Temple-White noted that some insider taking advantage of Trump’s tweets could run afoul of insider trading laws.